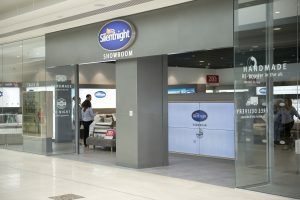 Silentnight has installed bespoke in-window and in-store digital signage solutions at its newly opened flagship showroom in the Intu, Lakeside Shopping Centre, Thurrock. Universal AV managed the project, choosing award-winning video wall mounts from AV technology pioneer Peerless-AV® for their installer-friendly features, UL safety assurance and compatibility with the major display brands. With headquarters in Barnoldswick, Lancashire, Silentnight is a recognised Superbrand in the UK, renowned for its passion, product knowledge, exceptional quality and sleep expertise, producing over 500,000 beds every year. 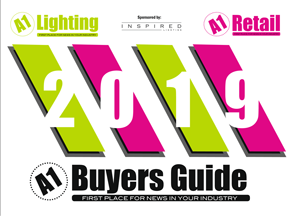 The company is committed to continuous investment and innovation in all areas of the business, and the nationwide Silentnight stores are no exception. 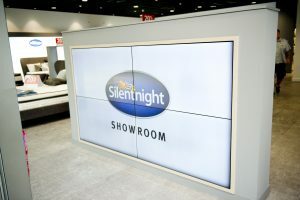 Silentnight HQ announced they were opening a second flagship showroom in the Intu, Lakeside Shopping Centre, in early 2018 and commissioned Universal AV to manage the project. Universal AV had previously provided audio visual solutions to the Silentnight head office. 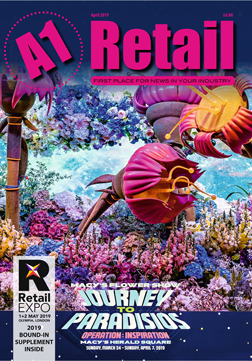 The new flagship store was to have the wow factor, greeting customers and encouraging them on their in-store retail journey. Universal AV provided a detailed scope and specification according to Silentnight’s specific requirements. The installation took place in May 2018, during the refurbishment of the store, and all AV requirements were fulfilled seven days prior to the store’s grand opening. Two 1 x 2 Philips 55” LCD Displays in purpose-built cabinets are positioned in the windows at either side of store entrance, a 2 x 2 Philips 55” LCD videowall in cabinet is situated upon entry, to further entice customers inside, and two additional Philips 55” LCD displays are installed in the staff meeting room and children’s activity area. Peerless-AV’s DS-VW765-LQR SmartMount® Full-Service Video Wall Mount with Quick Release stands out for its installer-friendly design and configuration versatility. Addressing today’s complex and challenging Digital Signage applications, the mount is manufactured to the highest safety standards and is packed with innovative features designed to save installation time and costs. A spring-loaded, push release mechanism provides convenient access for servicing and maintenance, while custom wall plate spacers eliminate guesswork and on-site calculations. A keyhole slot wall plate also speeds up mount positioning and allows for a single person install. For more information on Peerless-AV products and solutions, visit www.peerless-av.com. Follow the latest news and updates on Twitter, Facebook, LinkedIn, and blog.